Cowhide palm provides great durability for heavy duty work applications. 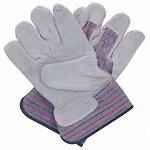 Kontour™ gloves conform to the natural shape of the human hand and provide proper finger alignment. In doing so, it achieves unprecedented comfort and dexterity. 140 gram Heatrac® micro-fiber insulation for ultimate warmth & comfort.